A review of Negotiating Modernity: Europeanness in Late Colonial Indonesia, 1910-1942, by Bart Luttikhuis. Negotiating Modernity is a conceptual and cultural study of the (self-)identification and categorization of various social groups in late colonial Indonesia. Bart Luttikhuis challenges the established notion in colonial studies that the colonial population was essentially subdivided into binary opposites – ruler and ruled, colonizer and colonized, “European” and “Native.” In colonial practice, he argues, the social position of individuals and groups was determined by a complex set of markers, such as race, class, culture and lifestyle, placing individuals and groups on a “multi-layered and gradual hierarchy” (p. 7). This hierarchy was less restricting than what one might expect, and to a limited extent it was possible to move up and down the ranks. Luttikhuis seeks to provide an explanation for the fact that the seemingly exclusive and demarcated subgroups in the colonial society were far from homogeneous, and were actually surprisingly mixed in terms of race, cultural background and socio-economic status. Although the colonial system undeniably favored European upper-class males, “Native” or “Indisch” individuals and groups could actually have successful careers in the colony and secure a favorable social position, by tactically employing “civilizing” features other than their ethnic background. In order to provide a more nuanced perspective over the predominant historiographical emphasis on race as the prime social determinant, for example in the work of Ann Laura Stoler and Frances Gouda, Luttikhuis attempts to unveil the rationale behind social hierarchies, and stresses the importance of language. Instead of seeing “Dutchness,” “Europeanness,” “whiteness,” “civilized/developed” and “modern” – or for that matter “blackness,” “poor,” “uncivilized” and “traditional” – as mere synonyms of a racialized notion of “ruler” and “ruled,” Luttikhuis meticulously studies the semantic interrelation and discursive application of these various terms in concrete social settings, such as courthouses, schools, and work floors. He finds that “Europeanness” became an increasingly popular term to signify “modern and civilized.” It was less racially defined than “White” or “Dutch” and allowed for more flexibility in applying it to individual contexts. In his attempt to reexamine the colonial categorizations, Luttikhuis interestingly revises the generally accepted political timeline of the late colonial period. In this timeline, for example visible in the work of Remco Raben, Ulbe Bosma and Drooglever, the “ethical” period in the 1910s and first half of the 1920s, aimed to educate, modernization and gradual emancipate the “Indisch” society; in contrast to the conservative and repressive period in the 1930s. Luttikhuis states that this conservative backlash of the 1930s took place mainly in the realm of politics, but that the colonial reality continued to become more flexible and variegated towards the end of the Dutch colonial period. The author does not describe the ethical period as an empty promise of development and a temporary experiment in colonial history, but turns the issue around and states that the “conservative 1930s” remained superficial, leaving space for hybridity between social groups. It was not just political repression in the 1930s which suppressed anti-colonial sentiment among the Indonesian population, but rather an “Indisch dream” among Indonesian middle classes that prolonged the late colonial period. Negotiating Modernity is divided into eight chapters, organized into three parts. The first part studies the ideological underpinnings and everyday reality of the colonial legal system in the Dutch Indies. This system subdivided people into three legal categories: “Europeans,” “Natives” and “Foreign Orientals,” but proved difficult to apply in reality. The first chapter focuses on the ideological tension between on the one hand universalist notions of equality and legal unification on a “modern,” i.e. “European” or “Western” basis, and on the other hand cultural relativist ideas on the importance of judging people according to “their own” traditions, cultures or racial qualities. Luttikhuis argues that the late-colonial state and its judges performed a constant balancing act between both conceptions of legal justice, and he proves this point by focusing on several legal cases. In Chapter 2, Luttikhuis discusses the porous character of the seemingly exclusive legal category of “Europeans.” This privileged category included a wide variety of groups that in some way or another had successfully claimed to be part of “modernity.” By examining, among other things, official requests of individuals to be granted a European legal status, Luttikhuis demonstrates that it was not just race, but also culture, class, education, religion, and lifestyle that could justify a legal categorization as “European.” As such, this group included a diversity of Dutch and other European migrants and officials, higher and middle-class “Indo-Europeans,” descendants of Ghanaian soldiers, Japanese migrants, and so-called “equated Europeans”: Indonesians or “other Orientals” who had a European life-style and were considered to be detached from their “own” society. Recognizing the permeability of, and the diversity within the “European” category, Luttikhuis challenges Ann Laura Stoler and others who, according to him, focused too much on the racial binary distinction between ruler and ruled. “The hierarchy of colonial imagination, rather than being obsessed with binary oppositions, was designed from the very start to be highly layered, with vague and slippery transitions between those layers” (p. 94). The second part of the dissertation discusses three interconnected case studies regarding education. Subsequently, the Kartini Foundation (sponsoring “western” education for Indonesian girls; chapter 3), the Carpentier Alting Foundation (establishing several elite schools in Batavia providing “Dutch” education rather than “European” or “Western” education; chapter 4), and Taman Siswa (an Indonesian-run educational organization trying to redefine “modern” Indonesian education with “western” elements, in contrast to a “European” or “Dutch” curriculum; chapter 5) are discussed. Luttikhuis observes the gradual emergence of a distinction between “European” and “Western” education, in which the former stood for exclusive education for “Europeans” in the colonial society, while the latter term concerned the content of the curriculum. In this case, “Western” education had a semantic overlap with concepts such as “modernity” and “progress.” The debates over the content and character of education took place against the backdrop of discussions on assimilation of young Indonesians into a “universal” notion of European modernity, or the adaptation of education to “Oriental” cultural standards. The third and final part of the dissertation focusses on the discursive and practical mobilization of identities on the work floor. In chapter 6, Luttikhuis examines the lower ranks of staff in railway corporations and in the Javasche Bank, and their self-identification as “middle class,” rather than as “Indo” or “Indisch.” He describes the employment policies of companies with regards to “imported” Europeans, versus “settled” Europeans and “native” Indonesians, which gave rise to many difficult issues concerning wage, tasks and hierarchy. As in the other chapters, Luttikhuis contends that the functional hierarchy was gradual and continuous, rather than discreet and rigid along ethnic and legal lines. “It was not unusual to find an Indische employee in a superior position to an ‘imported’ colleague” (p. 228). The seventh chapter focuses on these companies as well, and considers the regulations and rationales behind European furlough. Was this restricted privilege justified with racial, cultural or class arguments, and how did the furlough-goers reflect on their time in Europe? The last chapter investigates the social and domestic life in the Indies of the lower-ranked “European” staff of the railway firms. By studying a company housing project and a social club for railway employees in the small Javanese town of Tegal, it not only becomes apparent that the social sphere around this company was racially and socially mixed, but also that its members were self-consciously “modern” in an “Indisch” way, and were not just mimicking the metropolitan example. In Luttikhuis’ words: “[…] they created an idea of a colonial Dutch-Indies modernity which was related to, but independent from metropolitan modernity” (p. 294). Luttikhuis studies the discursive and practical history of the various identifications and categorizations in the colony, and examines them in a carefully selected set of social settings in which the legal categories were in interaction. Negotiating Modernity will be of use both for historians who study the practical and everyday applications of such vague categories like “western,” “European” and “modern,” as well as those interested in colonial hierarchies. This dissertation has made evident that the colonial language of difference was nuanced and precise, and that terms such as “western,” “Dutch,” “European,” “white” and “modern” were no easy synonyms for each other, broadening the potential readership to any historian interested in problematizing these concepts. European University Institute, Florence. 2014. 376 pp. Primary Advisor: Kiran Klaus Patel. 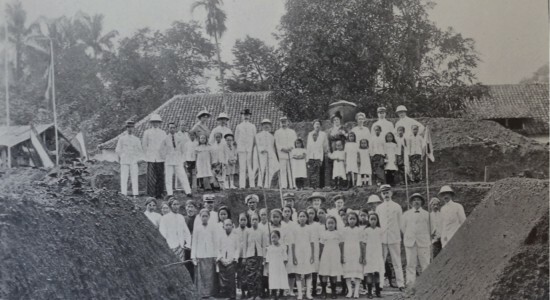 Image: Cornerstone ceremony for the Madiun Kartini school, 12 January 1915. Source: Jaarverslag der Vereeniging Kartinifonds 2 (1914), p. 36.